In celebration of National Roller Coaster Day Wednesday, California’s Great America debuted a first of its kind 1,800 foot single rail steel roller coaster for the 2018 season. The new roller coaster, RailBlazer, will feature an eight-passenger single file train that will lift riders to approximately 106-ft above the ground and plunge down at a 90-degree angle. The theme park explained that the ride was crafted in homage of the scenic highway State Route 1. While the inspiration may stem from a breathtaking road along the California coast, California's Great America has ensured that their fifteenth rollarcoaster will satisify thrill seekers. The roller coaster will travel at a high speed of 52 miles per hour while going through steeply banked turns, three inversions and a twist through a zero gravity roll. 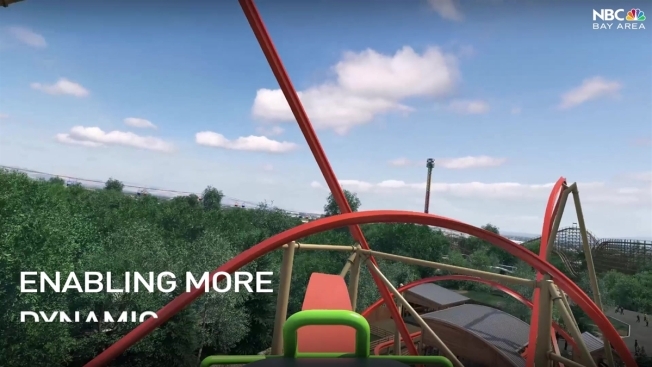 The design of the roller coaster will require riders to straddle the rail to create an extremely low center of gravity to amplify every move, turn and rotation. Santa Clara Mayor Lisa Gillmor also spoke at RailBlazer's reveal, hinting at the park's plans to install, "coasters two and a half times larger than what currently exists, an expanded waterpark and an entertainment district in the front of the park to entertain our residents 365 days a year."